Behold, one Ridiculously Cute Critter holding another! Seals are almost universally beloved for their cute appearance and playful behavior. Their face looks similar to a cat, making them the aquatic version of a Cute Kitten. This often carries over into fiction, when seals are portrayed as adorable and benevolent characters. One common kind of seal that is depicted are baby harp seals, which have plump bodies in snow white coats, big dark eyes and are entirely helpless on the ice. Although sea lions are much rarer in fiction than seals are, they can be included here too. Sea lions are different from seals - they have ear flaps, flippers that allow them to "walk" on land, and more - but the two animals are similar enough that a separate trope for sea lions isn't necessary. Selkies and Wereseals can also be included. Compare Warm-Hearted Walrus, Playful Otter, Friendly, Playful Dolphin, and Heroic Dolphin. Contrast Monstrous Seal. Has nothing to do with a certain British R&B singer. Jonathan from Kaleido Star is a cute little baby seal that Sora adopts as a pet. The San-X Mamegoma characters are a species of cute small seals who resemble harp seals. They eventually got their own anime series called Kupū~!! Mamegoma! in 2009. Selkie from My Hero Academia is a superhero who looks like a humanoid seal and has the abilities of one (like breathing underwater and using echolocation), and he often tries to invoke this trope by acting cute because he thinks children will love it. Unfortunately, his appearance is a bit too intimidating for it to work, though Tsuyu secretly thinks it's cute. Sanrio gives us Badtz-Maru's friend Hana-Maru. Hana-Maru is a good natured seal compared to Badtz-Maru who is always causing trouble and mischief. This is more notable in the anime Hello Kitty's Animation Theater which places Sanrio characters in roles as fairy tales characters. Stefano the Sea Lion from Madagascar 3: Europe's Most Wanted is a goofy, Adorkable circus animal who becomes a friend of the four protagonists, especially Marty the Zebra. Subverted in Penguins of Madagascar with Short Fuse, a tiny, fluffy seal with a high-pitched voice who is also the demolition expert for the North Wind, a secret animal agency. Saoirse from Song of the Sea is an adorable little girl who is a selkie, and thus can shapeshift into an equally adorable little seal. She is friends with some actual, non-shapeshifting seals who are almost as cute as her. The Direct-to-Video Animated Adaptation of William Shakespeare's Romeo and Juliet story, Romeo & Juliet: Sealed with a Kiss. It's a retelling of the story but with most of the main cast (except for a sea otter, a guppy and various sea creatures) being seals, especially sea lions and elephant seals. Romeo and Juliet are portrayed as adorable young sea lions. The sequel to Happy Feet has the adorable elephant seal pup brothers Shane and Darren, the sons of The Beachmaster. 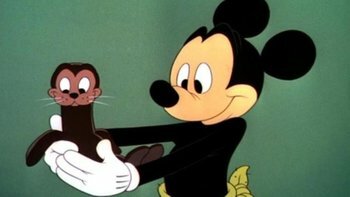 In the live-action Disney film 20,000 Leagues Under the Sea, Captain Nemo gets a Nonhuman Sidekick in the form of Esmeralda the Sea Lion, in true Disney tradition. The 1994 film Andre focuses on a girl who befriends a marine sea lion named Andre. The film is based on a true story of a similar encounter from 1962. Nim's Island has a sea lion who serves as a pet and companion to a young girl who lives on a island with her father. When her father leaves the island for a while it's up to the girl and the sea lion to protect the island from any trespassers. In the story "The White Seal" from The Jungle Book, the protagonist is Kotick an albino fur seal. At the beginning of the story, he is a cute and naive pup. However, he grows up over the course of the story and by the finale he is a huge, badass fighter capable of frightening off every other seal on the beach. Redwall: A few seals and sea lions appear in the series, and they're Always Lawful Good. Robby The Seal, from the German children's book series The Little Polar Bear. The protagonist named Lars first befriends him after exploring the Arctic by himself but later stumbles upon a young seal. Robby and Lars decide to play together and even head back to Lars' home where he asks his father if he can go play with his new friends. However, after Lars learns that he can't become friends with Robby, he decides to walk back to him and tell him that they can't be friends. Robby is already aware of the situation and can be seen crying quietly by himself. Eventually Lars' father and the other seals come to terms and agree that Lars and Robby are now best friends. The song "Lazy Harp Seal Has No Job" by Parry Gripp is about a harp seal who is extremely popular with the ladies despite not doing anything but lying around and being cute, which makes a photographer with an expensive camera and jacket jealous of him. Wolfgang is an excitable seal who communicates through a series of barks. If he so much as hears the word "fish", he is apt to go into a frenzy, so other characters have to avoid saying the word in his presence. There is one song called "Swim Like Sea Lions " that features footage of children swimming along with sea lions. Seel and Dewgong resemble harp seals with little tusks! Spheal is a little ball-like seal with little tusks like Dewgong. Popplio is a plucky little Non-Ironic Clown sea lion. Its evolution, Brionne, is just as energetic and sweet, while Primarina, its final evolution, is a beautiful opera singer resembling a mermaid. Clapper the Seal is a friendly character who helps the Kongs in the Donkey Kong Country games in some manner. He shows up in a few levels of Donkey Kong Country 2: Diddy's Kong Quest and may be the pirate-dressed seal you find in Donkey Kong 64. Rhythm Heaven Fever has a game called "Flipper Flop", where four baby harp seals dance by rolling around. In Sister Claire, Gabby the Selkie is an adorable seal pup or a cute, chubby human girl when she's on land. Awkward Moment Seal is a little elephant seal who seemingly has a horrified expression on his big-eyed face. The memes he's used in are about him getting into awkward situations and reacting with embarrassment. Seal of Approval is a Weddell seal with a blissful look on his face. The memes he's used in describe feelings that the creators find pleasant. Salty the Seal is a cute little nonanthropomorphic seal who often annoys Pluto, but eventually becomes friends with him. In Mickey and the Seal Salty hops into Mickey's picnic basket and goes home with him. The short Mickey's Circus features four sea lions, three adults and a pup who can be considered an early version of Salty the Seal. The mischievous sea lions cause much annoyance to their trainer, Donald Duck. The French animated series Seabert stars a white seal pup befriending two human children and rescuing other animals from Evil Poacher villains. One Tom and Jerry cartoon is "Little Runaway" that features a young seal that escapes from a circus and hides out in a backyard pool. Jerry Mouse discovers him there, and the two hit it off immediately. Tom Cat, however, hears news that this seal has a reward on its head, and tries to lure the runaway into his clutches. The Swiss stop-motion series Pingu gives us Robby The Seal, who is Pingu's best friend. Robby first meets Pingu when he decides to go ice fishing and Robby decides to play tricks on him and steal some of his fish. After Pingu gets annoyed with Robby's tricks he decides to chase him back onto thin ice. Robby attempts to escape by trying to slip through the crack. When Pingu yells at him it causes him to lose his grip and sprain his flipper, causing him to cry after he injures his hand. Pingu comforts him and gives him some food before returning home. Rocket Power has an episode titled "The Good Housekeeping Seal" where Twister encounters and befriends a very friendly and playful seal. He names him Bruce, even though, according to Lt. Tice, he "looks like a Walter". Real seals and sea lions zigzag this trope depending on the species and individual. While some larger species like elephant seals, leopard seals, and the larger sea lions are certainly large enough and sport lethal dentition to be dangerous; attacks on humans are extremely rare. Still it's often wise to give any wild pinniped, especially the multi-ton species, their space. Leopard seals are especially subject to this based off individual basis. Several recorded attacks and fatalities have been attributed to the species, but others are completely docile towards humans to the point of offering humans food (in the form of a mauled penguin) thinking they might be hungry. Elephant seals are typically gentle giants around humans despite their enormous size and the males' tendency to fight each other. Still, again, give them their space as a 4,000 kilogram elephant seal might throw its weight around without meaning to.